This apple cobbler gets fabulous texture and flavor from cinnamon and chopped walnuts in the apple filling. The cinnamon and walnuts are also sprinkled over the topping batter. 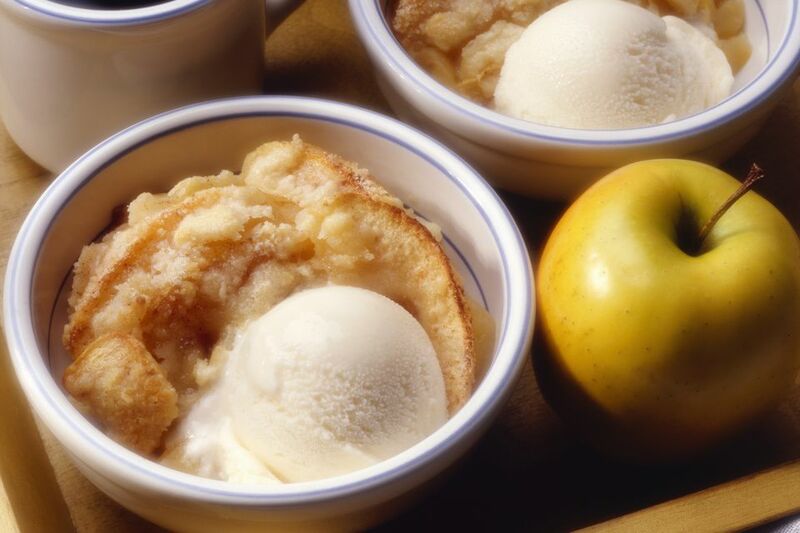 This delicious dessert can be enjoyed any time of the year -- it's especially delicious when it's made with local apples fresh from the orchard. Serve this wonderful cinnamon-spiced cobbler warm with a scoop of vanilla ice cream, or drizzle some heavy cream over it. It's also fabulous with freshly whipped cream! Arrange the sliced apples in a buttered 9-inch square baking pan. Combine 1/2 cup sugar, cinnamon, and coarsely chopped walnuts; sprinkle over apples. In a bowl combine the flour, 1 cup sugar, baking powder, and salt; stir well and set aside. In a mixing bowl combine the egg, half and half, and butter; whisk to blend. Add the flour mixture and beat until smooth; pour over apples. Combine the walnuts with cinnamon sugar mixture and sprinkle over the batter. Bake in the preheated oven for 50 to 60 minutes, until nicely browned.